The leaves have begun to change, pumpkin spice lattes are back and its time to pull out your plaid and scarves. Fall has arrived, which means lake season is officially over, but that doesn’t mean you can’t still enjoy your lake home in the autumn! And, you can start by updating your fall décor. It’s often difficult to choose just how to decorate your lake home for any other season but summer, especially in a way that reflects your personality and the latest trends. However, there are a few basic guidelines you can follow to help get you started decorating for fall on the lake. 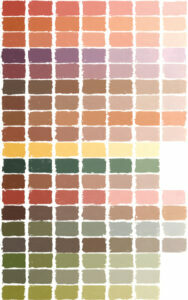 To begin, consider what color pallet you want to work with. Incorporate on statement color; this should be most prominent in your design. Popular statement colors include wine tones and emerald greens and burgundy. Also popular in the fall is navy and muted oranges. Next you will want to choose accent colors. These will complement your statement color and add depth to your design. Generally you will want to pick at least two accent colors, but be cautious of the amount of secondary tones you choose to incorporate. An excess of secondary colors could result in loss of cohesion in your design, meaning your vision will no longer be clearly present. Rather than having a cute, well-put together door decoration, the end result might start to resemble something along the lines of abstract expressionist art… or something a toddler threw together. A base of three colors, one statement and two accent colors, is a good starting point for beginning designers. At the lake, a great combination would be a base of navy, accented with silver and perhaps orange. Once you have decided on a color scheme, you should begin thinking about how you will accent these colors in your design. One thing to consider is patterns. Plaid, gingham, houndstooth and paisley patterns not only add to the color in your design but also gives it texture and dimension. A textured design has more impact, and is more aesthetically pleasing, than a flat one. Different materials, such a burlap and lace, also help with texture. Additionally, think about what iconic autumn symbols you want to feature. Pine cones, pumpkins, acorns, hay bales and leaves are all common accents. 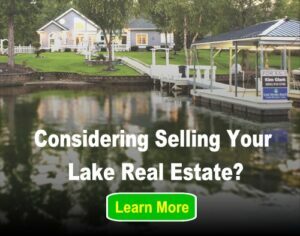 If your lake home is located in wooded area, you could easily find a few items in nature to use for free! 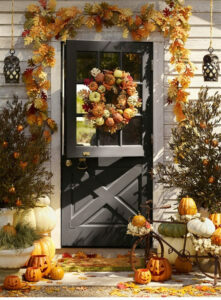 A wreath of pinecones, pumpkins resting on hay bales and garlands of acorns can all add depth to your décor. Don’t be afraid to mix and match patterns and accent pieces. Just because they don’t match doesn’t necessarily mean they don’t work well together. After you have your accents, patterns and colors determined comes the task of putting them all together. If you have no idea what you want the final product to look like, start by looking up ideas on Etsy, Google or Pinterest. Here you will find pictures of what other home decorators have done in the past, so you can see what works together and what best resembles your lake home’s style and personality. For a log cabin-style lake home, you could choose to feature red, greens and black plaids, burlap and metal accents. Additionally, you could incorporate twigs, pinecones and small logs into your outdoorsy design. Adding a pop of gold, with ribbon or beading, can give your decorations a little extra pop, as well. If your home is more modern, houndstooth, silvers and burnt orange might look best. Pumpkins would look good with this color scheme, as well as fall leaves, acorns and brushed metals. Should you not find any leads worth pursuing online, you can always just find your style through trial and error. Since you’ve already decided on colors, textures and accents, you can try a number or different design combinations until you find the right one. Don’t get discouraged if your vision doesn’t come through on your first try. Your perfect fall décor design is in there somewhere. Sometimes some distance will teach you to love your first try. And if it doesn’t, waiting a few days can often show you exactly where your problems with the designs lie. In the future, you can think about adding extra features beyond that which you already have. This might include changing porch lights to different colored bulbs, adding a bench or bike to your porch. Or, incorporate string lights and colorful mums or other living decorations. As years go by you’ll learn what works and what doesn’t, and you can add to your decoration cache over time. Eventually, you will you find the perfect balance. And when in doubt, just keep it simple, as lake living should be. For more tips and ideas, enjoy our other seasonal decorating articles here.